Consumer Action created this backgrounder as part of our Money Management 1-2-3 financial empowerment training module. This adult education module also contains three multilingual brochures and a lesson plan with companion PowerPoint presentation. The three sections of the module can be presented individually or together depending on the learning level and life stage of the participants and the time available for training. Trainers can also combine parts of each of the three sections to create their own unique training that addresses the specific needs of their clients. Following are frequently asked questions about the topics covered in each section of the Money Management 1-2-3 module. Use the information below to facilitate discussion during class, to encourage continued, independent learning after class, and to empower learners to make wise choices and protect their rights. Wise choices about how to use your income and credit when you’re young—or if you get a late start—help you build a strong foundation for financial security. Prioritizing spending, establishing a savings habit and keeping consumer debt to a minimum enables you to achieve important financial goals sooner. And once you understand the basics of taxes, borrowing and banking, you’ll be well prepared for even greater financial responsibilities and opportunities. The way you manage your money during your working years will profoundly affect the way you live out your later years. Key goals during this time should be to increase assets, build a retirement nest egg and protect what you have. To do all that, you’ll also have to avoid the temptation to live a lifestyle beyond your means. At some point, the working years become the retirement years. Changes in income and expenses can be difficult to adjust to at first. To make the transition as smooth as possible, you’ll need to step up your planning and saving in the years just before you retire. Following are frequently asked questions about the topics covered in Part 1 of the Money Management 1-2-3 module. My employer says that I have to receive my wages on a payroll card. What are these, and do I have a choice? A payroll card is a reloadable prepaid card used to pay employees their wages electronically. Each payday, your net wages would be deposited directly into the payroll card account. You could then use the card anywhere a debit card is accepted to buy things, get cash and pay bills. There are some advantages to payroll cards over paper paychecks, but the best option typically is direct deposit into a fee-free or low-cost checking account. In workplaces where payroll cards are offered, you must be given at least one other wage payment alternative, such as direct deposit. Some states require that employees also be given the option of receiving a paper check. Before agreeing to a payroll card, check the fees associated with it so that you can compare the cost of the card to the cost of your other option(s). If you agree to a payroll card and then change your mind, your employer must allow you to switch. Learn more in Consumer Action’s An Employees’ Guide to Payroll Cards. Is there any way I can predict how much will be taken out of my paycheck for taxes? If you contribute to a flexible spending account (FSA) to set aside pre-tax dollars for health care expenses, dependent care bills or transit costs, you eventually will receive that money back to use for those purposes, but your paychecks will be reduced in the meantime. You can use an online calculator to see how using an FSA could save you money on taxes. If your employer offers FSAs, ask the payroll or HR department for more information. How can I manage my paycheck to get more money each pay period? One way to increase your net pay (beside working more hours) is to increase the number of allowances you claim on your W-4 form. This reduces the amount of income tax withheld. However, it’s important not to have too little withheld or you might be surprised with a tax bill. The IRS online W-4 calculator can help you choose the right number. Another way to increase your net pay is to get a portion of the Earned Income Tax Credit (EITC) in each paycheck rather than waiting for a check from the IRS when you file your return. To find out if you qualify for the credit, read Consumer Action’s EITC publication, Get Credit for Your Hard Work. There are special rules for calculating income if you are a member of the clergy or the military or if you receive disability benefits or have a disabled child. Learn more at the IRS website. While contributing to an employer-sponsored retirement account or a flexible spending account won’t actually increase your paycheck—in fact, it will decrease it—it will stretch your dollars further by reducing the amount of income tax you pay. A flexible spending account (FSA) is offered as part of a “cafeteria plan, which is an employer-sponsored reimbursement plan that allows you to set aside pre-tax dollars for eligible medical and/or dependent care expenses (separate accounts). (Two less common types of FSA are designed to save pre-tax dollars to use for adoption expenses and health care insurance premiums.) Not all employers offer a cafeteria plan, but many do. You should estimate your anticipated annual expenses very carefully to avoid losing money, since account balances that go unused past the deadline are lost. The deadline for using FSA funds in many workplaces is the end of the benefits year, which for most workers is Dec. 31. However, the IRS allows employers to give FSA owners until March 15 of the following year to use the money. But this grace period is optional—make sure you know what your employer’s policy is. Employers also have the option to allow employees to roll up to $500 in unspent FSA funds over to the next benefits year. Again, know your employer’s policy before the end of the year. For a list of eligible FSA expenses, visit www.SpendingAccounts.info/PDF/eligible_expense_guide.pdf. What is a Transportation Reimbursement Incentive Plan? A Transportation Reimbursement Incentive Plan, or TRIP program, is similar to an FSA, but the dollars are earmarked for transportation costs to and from work, including parking and public transportation. If your employer doesn’t offer a TRIP program or flexible spending accounts, make a request to the HR/Benefits department. If enough employees ask for them, the employer might make them available. What can I do if I believe my employer is not paying me what I am owed? If possible, try to resolve the payment issue directly with your employer. If you are unsuccessful, contact your state’s labor department or the U.S. Department of Labor’s Wage and Hour Division (866-4USWAGE (487-9243)/TTY 877-889-5627) for information and assistance. The Legal Aid Society of San Francisco offers a free guide called “Do-it-Yourself Recovery of Unpaid Wages”. Because it was last updated in 2004, some information may be outdated. However, it is still a good general resource, which includes sample letters to the non-paying employer. Learn more at the Legal Aid Society’s Wage Protection Program web page. Where can I learn more about my rights as an employee? I’m self-employed. How can I estimate my tax liability? You’ll first need to estimate your income and your deductions as accurately as possible to determine your net profit or net loss—a challenge for some businesses. Any net profit becomes income on your Form 1040. From there, you can estimate your self-employment tax (calculator), which covers the Social Security and Medicare taxes that are paid by employers for their employees, and your income tax. Self-employed individuals usually have to pay estimated taxes each quarter. This allows you to avoid a big tax surprise at the end of the year since you can adjust your estimates each quarter if necessary. Learn more at the IRS Self-Employed Individuals Tax Center. You can also get a good overview from Motley Fool and eFile.com. I earn tips or money from a side job. Do I need to report this income? If you earn more than $20 in tips per month, you’re required to notify your employer so that payroll withholding, Social Security and Medicare taxes can be calculated and deducted from your paycheck. Regardless of the amount of tips (even less than $20 in a month), you must report the income when you file your taxes. Learn more about reporting tip income at the IRS website and IRS tip income publications. Are there other sources of income tax preparation assistance besides VITA? In addition to the Volunteer Income Tax Assistance (VITA) program, there is the AARP Tax-Aide program and, in some regions, the United Way tax preparation assistance program. In the San Francisco Bay Area, visit www.EarnItKeepItSaveIt.org to find local United Way tax prep assistance. I don’t qualify for VITA free tax preparation services. How do I find a qualified tax preparer? Avoid incompetent or dishonest tax preparers by finding a qualified professional through the IRS Directory of Federal Tax Return Preparers with Credentials and Select Qualifications. Can I prepare my tax return myself? Yes, you can—and it’s probably easier than you think thanks to computer software that walks you through the process step by step. TurboTax and TaxACT are two popular tax preparation software programs, but there are others. The IRS provides information about how you can use these and other tools to file your federal taxes for free. If you have a very simple return, you may even be able to complete your return yourself without computer software. However, if the prospect of preparing your tax return on your own leads you to miss the deadline or not file at all, you are better off getting free assistance or even paying a professional. The IRS offers tips for choosing a qualified tax return preparer. What if I don’t file my tax return for one or more years? You should always file your tax returns, even if you can’t afford to pay all of the taxes you owe. If you don’t file, the IRS will file a substitute return for you. This will always be the worst-case scenario because the return is based only on information the IRS has from other sources. That means, for example, you would not get any dependent deductions or itemized deductions (charitable contributions and business expenses, for example). Essentially, the IRS takes your income, taxes it at the highest rate and deducts any federal tax you paid. Not filing also means you miss out on credits such as the Earned Income Tax Credit. If the IRS determines you owe taxes, it starts the collection process, which can include placing a levy on wages or bank accounts or placing a lien on your property. Continued non-filing and non-payment could result in additional penalties and/or criminal prosecution. Even if the IRS has already filed one or more substitute returns for you, you still should file your own returns for those years to take advantage of all the deductions, exemptions and credits you’re entitled to. If you don’t have the information you need, such as W-2s and 1099s, the IRS can help you get them. Once the IRS accepts your return, the tax is adjusted. If you are due refunds, filing the returns will close your case. (Refunds more than three years old are forfeited.) If you owe taxes, then interest and penalties will be added to the past-due amount. Depending on your circumstances, you may qualify for a payment plan or an offer in compromise. The IRS provides assistance to help taxpayers get back on track (800-829-1040). Does the Affordable Care Act require me to do anything different on my tax return? If you had employer-sponsored or individual health insurance during the year, nothing will be different about your taxes. If you purchased insurance from a government “marketplace,” you will receive IRS Form 1095-A in January. All you have to do is enter the form info when prompted by the tax preparation software. If you received an advance premium credit for your insurance purchased through the marketplace, you might receive a bigger tax credit or have to repay some or all of the credit you received if your income for the year was higher or lower than you estimated when signing up for coverage. If you did not have insurance for three or more months of the year, you will be subject to an Individual Shared Responsibility Payment penalty unless you qualify for an exemption. Mail your exemption application as soon as possible so that you receive your exemption certificate number (ECN) in time to report it on your tax return. Where can I learn more about checking and savings accounts? Consumer Action’s free educational materials on checking and savings accounts cover everything from choosing and opening an account to managing account costs and taking advantage of online banking. They also offer advice if you are having trouble opening an account either because you are an immigrant without a Social Security number or because you have mishandled an account in the past. Banks are for-profit corporations that measure their business success by the amount of profit they make and the price of their stock. They typically offer many branches and ATMs, 24/7 customer service and a variety of investment products. Credit unions are non-profit cooperatives—in other words, they are owned by their members. Since they don’t have to answer to shareholders, profit and share price are not the motivating factors in their business practices. They also tend to have lower overhead costs because they are exempt from most taxes and do not typically pay huge executive salaries. Members benefit from these savings in the form of lower service fees, lower interest rates and fees on credit and loans, and higher interest rates on deposits. Most credit unions are local and, therefore, tend to offer more personal service. However, they are unlikely to offer as many conveniences as large banks do. Visit www.aSmarterChoice.org to find a credit union you are eligible to join. The Federal Deposit Insurance Corporation (FDIC) is a government agency that insures account balances in banks. The coverage is up to $250,000 per person, per account type at the same bank. You could have more than $250,000 insurance coverage at the same bank if you have different kinds of accounts, such as an individual savings account, a joint checking account, an individual retirement account (IRA) and a certificate of deposit (CD). Or you could have more than $250,000 in coverage if you have accounts at different banks. Federally chartered credit unions offer similar insurance through the National Credit Union Share Insurance Fund (NCUSIF) rather than the FDIC. The coverage levels are generally the same as those provided by FDIC-insured banks. Insurance does not cover money you have in things like stocks, bonds, mutual funds, life insurance policies or annuities, even if they were sold to you by an insured financial institution. Before opening an account, make sure the bank or credit union is federally insured by looking for the FDIC or NCUSIF notice at the branch or on the website. Should I opt in to overdraft protection for ATM and debit card transactions and/or opt out of overdraft protection on my checks and automated payments? Overdraft protection means your financial institution will process your transaction even if you don’t have enough money in your account. “Courtesy” (automatic) overdraft coverage typically results in very high fees (an average of around $30 per overdraft). If you want overdraft coverage on your debit card transactions, you must “opt in” (consent). Otherwise, those types of transactions that would cause you to exceed the balance in your checking account would be declined. Consumer Action recommends that you do not opt in to courtesy overdraft coverage for debit card transactions, because the consequences of having an ATM withdrawal or a point-of-sale purchase declined typically are not serious (no “bounced check” fees or late payment charges), and a small purchase (a cup of coffee, for example) is generally not worth a hefty overdraft fee. If you don’t opt in to debit card overdraft coverage, any debit card transactions that would cause your account to be overdrawn would simply be declined, and you would pay no fee to your bank. Your bank is allowed to provide overdraft coverage for your checks and automated recurring monthly payments without your opt-in. Generally speaking, it’s a good idea to allow overdraft coverage on these transactions because the alternative may be a bounced check, which comes with additional consequences, including, in many cases, a returned check fee from the merchant. A better option than courtesy overdraft coverage is to sign up for an overdraft protection plan that links your checking account to a savings account, credit card or line of credit. Under these optional overdraft protection plans, the bank transfers money from the linked account to cover your overdraft(s) as needed. Even though there are still costs to overdrawing your account, they are much lower than courtesy overdraft coverage. Learn more about overdraft coverage and costs in Consumer Action’s The Right Overdraft Protection Plan. Where can I learn how to balance, or reconcile, my account? Balancing, or reconciling, your checking account allows you to confirm that you and the bank show the same balance and allows you to spot any fraudulent transactions or mistakes. It also helps you avoid spending more than you have and incurring overdraft fees. Your bank should provide instructions for reconciling your account either with the statement you receive or on its website. You can also turn to the Internet, where there are dozens of webpages and videos that show you how to balance your checking account—just search for “how to balance a checking account” (or substitute the word “reconcile” for “balance”). Between statements, use the phone, ATM or Internet (whichever method is free) to check your balance and see when deposits, checks and debits have cleared. If you have a joint account, designate one person as the keeper of the check register. Where can I reorder checks? My debit card has a Visa logo on it, and the merchant asked me “Credit or debit?” Does this mean I will receive a bill for my purchase later? For smaller transactions, you may not be asked for a PIN or a signature. Record all debit card withdrawals and purchases in your check register. I’m in the military. What are my options for opening checking and savings accounts? Establishing a checking and savings account is a crucial step toward avoiding alternative financial services (check cashers, for example). In addition to banks and credit unions open to the general public (some offer no- or low-fee “active duty” checking accounts), you have access to financial institutions that cater to servicemembers and vets. Check out Military.com’s “10 Best Military Banks of 2015”. These will most likely be good options in 2016 and beyond, but shop around and compare. I’m a veteran and I receive my benefits on the Direct Express debit card—is there any reason to open a checking and/or savings account? The Direct Express debit card is a better option than using a check casher, but it isn’t as good as having checking and savings accounts. First, it’s smart to establish a relationship with a financial institution that can help you when you need a car loan, mortgage, short-term loan or other financing. Second, a card is not a good place to keep your savings—your money doesn’t earn interest and it can be tempting to spend whatever is on the card. Third, even though the Direct Express card does not have high fees compared to non-government prepaid cards, it still may be more expensive than a checking account. For example, many checking accounts allow you to pay bills for free using the bank’s online bill pay system, while the Direct Express card charges 50¢ per bill payment. Fourth, a checking account offers maximum flexibility—you can write checks, use a debit card to get cash and make purchases, pay bills online and transfer money to other accounts. If you continue using the Direct Express card, understand which card or account activities incur a fee so that you manage your card use to avoid them. For example, a Direct Express paper statement mailed to you costs 75¢ per month. You can avoid this fee by checking your account transactions and balance online. Learn more about Direct Express, including fees and fee-free options. As a member of the military, I wonder, what’s the difference between using my bank’s online bill pay system and paying creditors through discretionary allotment? A military discretionary allotment is a system for having payments to creditors made directly out of your pay before you receive it. Some creditors require, or strongly suggest, setting up automatic debt payments from your paycheck—this ensures they receive their money regardless of any changes in your financial circumstances. But servicemembers often incur third-party fees for processing the allotment. More important, allotment makes it impossible to delay a creditor payment if you have a financial emergency or a reason to end the arrangement entirely. And because the money comes out of your paycheck rather than your bank account, you lose the protection against unauthorized payments that a checking account provides. If you have a checking account, you can have your creditor pull the money you owe from the account on a specified date or you can make electronic payments using the online banking system. In either case, you have much greater flexibility to withhold a payment, if necessary. I don’t have a Social Security number, but I want to open an interest-bearing savings account. How do I get an ITIN? If you are not a citizen and don’t have a Social Security number, you’ll need an Individual Taxpayer Identification Number (ITIN) if you want to open an interest-bearing account. Visit www.IRS.gov or call 800-829-3676 to get Form W-7 (Application for IRS Individual Taxpayer Identification Number). In some cases, if an ITIN is needed, the financial institution will help you apply for one. My account application was turned down. What can I do now? If your name is in the ChexSystems database, you will have difficulty opening a new account, but there are some programs that can help. CheckWise is a personal finance course developed by the American Center for Credit Education. The program allows you to take a course on checking account management and receive a certificate of completion that is accepted by some financial institutions that offer “second chance” accounts. Ask the financial institution you are considering if they participate in the CheckWise program. Or type “CheckWise” and your state into a search engine to see if there’s a program near you. If not, contact local community-based organizations active in financial literacy to see if similar programs exist. Learn more about your options in the FDIC’s article “You’ve Been Turned Down for a Checking or Savings Account. Now What?”. Who should I contact if I have a complaint about my bank or credit union? Always try to resolve problems directly with your financial institution first. If that doesn’t work, the FDIC offers advice for consumers who have a complaint against their bank along with a list of agencies to contact. Generally speaking, you should contact the Consumer Financial Protection Bureau (CFPB) regarding complaints for most financial products and services. You may also contact your state’s consumer protection offices, banking authorities and office of the attorney general to complain against lenders doing business in your state. I can’t get—or don’t want—a bank account. Is a prepaid card a good substitute? Stored value, or prepaid, cards look like credit or debit cards and can be used in many of the same ways, for purchases from merchants that accept cards with the same payment network logo (Visa, MasterCard, Discover, American Express). You can have your paycheck, benefits check or other income deposited directly onto most prepaid cards. And many cards allow you to make bill payments or transfer funds. Another advantage is that, with the vast majority of cards, you can’t overdraw your account and rack up overdraft fees. If you can open a good checking account with a credit union or local bank, that is usually the best option. If not, a good prepaid card can be a decent option. Learn more in Consumer Action’s publication Choosing a Prepaid Card. What are my other options for paying individuals or bills? Payment services have become popular for making payments to individuals (peer-to-peer) and to some merchants and service providers. The payment services, which you access via a website or via an app downloaded onto your smartphone, are offered by financial institutions and by standalone payment service providers. Exactly whom you can pay, what it costs and how you initiate the payment depends on the service you choose. Learn more in the peer-to-peer payments issue of Consumer Action News. How can I find electronic budgeting templates to help me develop a spending plan? What is the “envelope” method of budgeting? The envelope budget is a way to manage variable, and sometimes discretionary, expenses such as groceries, restaurant meals, entertainment, clothing, etc. In a nutshell, you put the monthly budgeted amount for each spending category in an envelope and then pull money from there each time you spend. If there’s no money left in the envelope, then you don’t spend any more on that category that month. If there is money left over, you can use it as you wish, or add it to savings. Learn more about envelope budgeting at www.DaveRamsey.com/blog/envelope-system-explained. There’s even an online version of the envelope budget. What should I be spending on different categories of expenses? Here are different recommendations from two other sources, Elizabeth Warren and Jean Chatzky (www.GoBankingRates.com/personal-finance/divide-paycheck-perfect-budget/). Some people will spend more in one category and less in another. That’s fine—the key is to balance out to 100 percent. Note that an incentive for paying off debt is being able to devote that percentage of your budget toward more rewarding uses, including savings. Consider driving a less expensive car or renting a less expensive home. Share a subscription with a friend, go out for coffee or breakfast rather than dinner, put creativity before cost when it comes to gift giving. Take advantage of free services and entertainment. For example, get free immunizations at public health clinics and borrow books and movies from the library. Break expensive habits such as fancy coffee drinks, deli lunches and lottery tickets. Compare prices on everything, from insurance and cable TV service to checking account fees and prescriptions. Avoid temptation—don’t go shopping for fun. Scrutinize every expense and ask yourself if there is a less expensive alternative. For example, could you share a lawn mower with a neighbor rather than buy your own? Do an online search for “how to cut expenses” to find dozens of lists of cost-cutting ideas. Will cutting out my daily latte or other small expenses really make a difference to my bottom line? Reducing small but frequent purchases for non-essentials can make a huge difference in your financial security over the long term. Use the online “Latte Factor Calculator” to see just how much you could accumulate in savings by making relatively small cuts in your spending. Take a part-time or weekend job. Provide a service such as babysitting, sewing, gardening, cooking, cleaning, making repairs, etc. Be wary of offers to make money doing simple tasks at home—many of these are scams. Be particularly careful of money-making schemes that require you to pay a fee or buy a lot of materials before you can start. Visit the FTC online to learn how to recognize and avoid work-at-home schemes. Where can I learn about government or private programs that might help me make ends meet? Consumer Action’s Financial Empowerment Resource Sheet provides information and resources to help you manage your money during difficult times, including government programs that you might qualify for to boost your family’s income and help make ends meet. The 15-page Servicemembers and Veterans Financial Empowerment Resource Sheet offers dozens of additional resources that provide assistance specifically to servicemembers, veterans and their families. A credit counseling agency operating in your community can direct you to local assistance programs. To find an accredited non-profit credit counseling agency, contact the National Foundation for Credit Counseling or call 800-388-2227. Check with your local social services department. They can tell you if you qualify for programs such as food stamps (SNAP), free school lunch or WIC (aid for women, infants and children). The United Way compiles a database of programs that help with everything from rent and food to clothing and child care. Visit www.UnitedWay.org to learn more and to find your local United Way. If you belong to a religious organization, it may be able to help as well. Many cities have implemented special 211 or 311 phone numbers to provide access to local non-emergency services and information. To find out if the service is available in your area, try dialing both numbers to see if one works. Where offered, the services are free, private and provide information about community, social, health and government services. Where can I learn more about credit? Most accredited non-profit credit counseling agencies offer educational materials online and in print. Many also offer workshops and seminars on credit, debt management, money management and housing topics. Visit www.NFCC.org to find an agency near you. The Federal Trade Commission offers an overview of key credit and borrowing concepts online. Websites such as www.CardHub.com, www.Bankrate.com, www.Credit.com and www.NerdWallet.com have extensive libraries of credit information and tools. Consumer Action offers free publications that cover credit-related topics ranging from establishing and improving your credit to dealing with debt. Visit Consumer Action website to view the library. How do I interpret my credit score? There are several credit scoring systems. The most widely used is the FICO score, named for Fair Isaac Corporation, the company that developed it. Each of the three national credit reporting agencies (Equifax, Experian and TransUnion) also assigns a score using its own version of the FICO model. Together, they have also developed their own joint scoring model, called VantageScore. Additional scores have been developed by credit reporting agencies, lenders and other companies. To understand how you rate in a creditor’s eyes, you have to know what credit scoring model is being used and where you rank on that particular scale. A chart at www.myFICO.com lists prevailing interest rates by approximate FICO score. Other scores will include information about how you rank on those scales. Read more about credit scoring in in the Winter 2015 issue of Consumer Action News and at Investopedia.com. I’m in the military. How can I find out what my credit score is and what is in my credit reports? All consumers can request a free copy of their credit report every 12 months from each of the three major credit bureaus at Annual Credit Report website. Active duty servicemembers and their spouses can request a free FICO credit score at SaveAndInvest.org. (Access to your score requires assistance from a military financial educator through the Personal Financial Management (PFM) program at your Airman and Family Readiness Center, Army Community Service, Fleet and Family Support Center, Marine Corps Community Services or their equivalents.) Many credit card issuers and banks provide a free score to their customers. You can also get a free score at www.CreditKarma.com, www.CreditSesame.com and www.Credit.com. These sites don’t provide your FICO score (the one most widely used by lenders), but the score they provide will give you general idea of how creditworthy you appear in a lender’s eyes. In addition to your credit report, there may exist one or more other types of reports about you. These “specialty reports” compile specific types of data about you that is of use to particular types of businesses. Not all specialty reports exist for every consumer, but most consumers have one or more. You have the right to see your reports. Learn more in the Specialty Consumer Reports issue of Consumer Action’s newsletter. I need a car to get to work, but I don’t have enough saved up to pay cash. Where’s the best place to get an auto loan? Credit unions, banks, online direct lenders, loan brokers, auto finance companies and car dealers all offer auto loans, but not all sources offer equally attractive terms. Before you need to take out the loan, request your credit reports at Annual Credit Report website. (You are entitled to one free one from each of the three major credit bureaus each year.) If your credit card issuer or bank doesn’t offer a free credit score, request one at www.CreditKarma.com, www.CreditSesame.com or www.Credit.com. Although these sites won’t provide you the widely used FICO score, the score you get will help you know generally what kind of rates and terms you may qualify for. Interest rates on loans for borrowers with so-so credit can be 60 percent higher than the rates available to borrowers with excellent credit. Borrowers with poor credit may be asked to pay a rate that is two to four times higher. Learn how to get the best auto loan in Consumer Action’s Get a Car Loan That’s in Your Best Interest. How can I buy a car with a low, or no, credit score? The best option is to either save up the cash to buy the vehicle outright or to delay purchasing it until your credit score is much better. If you must have a car now and can’t avoid financing it, here are some things to consider. If you have a low (below around 660) or no credit score, it will be more difficult and expensive to get a loan. Before you shop for your vehicle, check your credit reports (free from each of the three credit bureaus every 12 months through Annual Credit Report website) to make sure there are no errors that might be pulling your score down. Even consumers with credit score issues should shop around for financing and not jump at the first offer. Check with local banks and any credit union you’re eligible to join before considering whatever financing the dealership offers you. Credit unions, in particular, tend to have more flexible underwriting guidelines and consumer-friendly loan terms. Check financing options with reputable auto dealers—don’t assume you won’t qualify. It’s wise to avoid “buy here, pay here” dealerships, which tend to charge exorbitant interest rates and extend loans with terms and conditions that make them inconvenient (payments must be made at the lot each month) and difficult to fulfill, increasing your risk of having the vehicle repossessed. Having a co-signer with good credit is one way to get a loan if you can’t qualify on your own. But be aware that if you don’t make the payments, your cosigner is on the hook, and his or her credit can be damaged if you default. Consider leasing a car instead of buying. This isn’t always the very best option economically—buying a reasonably priced car and holding on to it for a long time typically is better—but leasing usually requires a much lower downpayment, maintenance is included, and by the time the lease is up (and you’ve made all your payments on time), you should have a better credit score. If you can’t get reasonable financing now, try to hold off on your purchase until something improves—you find a job or are at your job for longer, get a raise, correct errors on your credit reports, etc. Don’t jump at any offer just to get into a car. Taking on a high-interest loan over a longer term (five or more years) can put you in a financial hole that you won’t be able to dig out of. CreditCards.com offers more details on getting a car with a low or no credit score. And Consumer Reports compares the financial considerations of leasing and buying a car. I’ve always stayed on top of my bills, until I got sick and needed an operation. Will my unpaid medical bills ruin my credit? Unpaid medical bills can still do damage to your credit, but beginning in mid-2015, the three major credit reporting agencies began implementing changes to soften the blow in some cases. Specifically, medical debts won’t be reported until after a 180-day waiting period to allow time for insurance payments to be applied. The agencies also will remove previously reported medical debts as soon as they are paid by an insurance provider, and these won’t affect your credit score. Outstanding medical debt that has been reported will count for less under the FICO 9 scoring model. However, while FICO is the most widely used scoring system, there are other scoring models that may not follow the same guidelines. And even those using FICO might be using an older version that doesn’t soften the impact of medical debt. This could delay the benefits of the policy changes. Who do I complain to about my credit card company, a lender or a reporting agency? If you have a complaint about a particular transaction or account, try to resolve it directly with the card issuer, lender or reporting agency first. If you are dissatisfied with the outcome or if you think that the company is engaging in bad business practices in general, lodge your complaint with the Consumer Financial Protection Bureau online or at 855-411-2372. How would I know if someone has stolen my identity? Being denied such things as credit, a job, insurance or a home rental for no obvious reason. What should I do if someone has fraudulently opened an account in my name or made unauthorized charges on one of my existing accounts? The Federal Trade Commission lays out the specific steps you should take if you find that you are a victim of identity theft (www.consumer.FTC.gov/features/feature-0014-identity-theft and https://www.consumer.FTC.gov/articles/pdf-0009-taking-charge.pdf). A step up from the fraud alert is the security freeze. It restricts access to your credit report, thereby preventing anyone from opening new accounts in your name without first contacting you for permission. A security freeze can only be lifted by the consumer who placed it, and it can delay access to future credit. Check the fees and requirements for your state at one of the major credit bureaus: Experian, Equifax or TransUnion. Be aware that neither a fraud alert nor a security freeze prevents the use of your existing accounts by an identity thief. If you become aware of fraudulent accounts or unauthorized charges, contact the creditors to close the accounts and dispute the debts. Tell the company’s fraud department that you are a victim of identity theft. Follow their instructions for disputing the charges. File a police report and request a copy. It may be needed to dispute charges and to place an extended fraud alert on your credit reports. File a complaint with the FTC or 877-438-4338/TTY: 866-653-4261. Remain vigilant for any signs of fraud in the future. Check your credit reports frequently. How long will it take me to build a positive credit history? It can take from six months to two years of on-time payments and responsible use of credit to build the kind of credit history most lenders consider reliable. What are my rights if I’m denied credit? Lenders are required to tell you specifically why you were denied credit or charged a higher interest rate. They also must provide you with your credit score and access to a free credit report if this information was used in their decision-making process, even if you already requested your free reports for the year. This is your opportunity to determine whether the lender (or card issuer) had a good reason to deny you credit (because you had too much debt or a spotty payment history, for example) and it makes you aware of steps you could take to improve your credit. You will also learn if there are mistakes on your credit report that need to be corrected. Where can I find a consumer-friendly secured credit card? You can search the Internet for lists of the “best secured credit cards.” NerdWallet does a nice job of narrowing down your options to just a few very good ones. What is a prepaid card, and will it help me build a credit history? Stored value, or prepaid, cards look like credit cards and can be used in many of the same ways, but they are not a form of credit. Before you can use the prepaid card, you must “load” it with funds—in other words, you have to put money onto the card. The card cannot be used until funds are loaded onto it. As you use the card, the money you spend is deducted and the balance goes down. When the balance gets low, you can “reload” (add more money) and keep using the card over and over. You can generally use the card for everyday purchases from gas to groceries, and to shop online, withdraw cash, pay for a rental car, airline ticket or hotel stay, and, depending on the functionality of the card, pay bills online or by phone. Like credit and debit cards, many reloadable prepaid cards are branded with the logo of one of the four major electronic payment networks: American Express, Discover, MasterCard or Visa. Businesses worldwide that are a part of the same network will accept the cards. While a prepaid card can offer safety and convenience for consumers who can’t get or don’t want a credit card and/or a checking account, they cannot help users establish or build a credit history. Learn more in Consumer Action’s publication Choosing a Prepaid Card. Find a low-cost prepaid card through resources such as Bankrate.com and NerdWallet. Are there any kinds of credit I should avoid? Some types of credit are a much better deal for the lender than for you. For example, payday loans, which extend a cash advance on a post-dated check or the next direct deposit into your account, charge exorbitant interest rates that make it difficult to get out of debt. Car title loans require you to sign over the title to your car as security for a high-interest, short-term loan representing just a fraction of the vehicle’s value. If you can’t repay the loan and fees, the lender can take your car. Generally speaking, avoid any credit that carries high interest rates, assesses high fees and imposes consumer-unfriendly terms (such as an unusually short or long repayment period or a prepayment penalty) in comparison to similar types of credit. Borrow only from reputable lenders. Be wary of any loan offer that asks you to pay money up front. Read the credit agreement before you agree to it, or have someone you trust review it with you. Vet the lender by doing an online search for the company name and reading consumer reviews and complaint statistics, and check it out with the Better Business Bureau. You can also see complaint information in the Consumer Financial Protection Bureau’s Complaint Database. I received a credit card offer with a “zero percent” fixed rate. Does this mean I’ll never have to pay interest? This is only an introductory offer. Your interest rate will be adjusted to the “go to” rate when the introductory period ends, which must be at least six months but may be longer. Be aware that many companies will cancel your introductory rate if you make late payments. How do credit card companies notify me about changes to my card terms? Card companies must send “change of terms” notices to cardholders when they make any material (significant) change. Legally, these notices must be sent at least 45 days ahead of the date the change will take effect. You could miss these notices if you’re not careful to check for “bill stuffers” in your monthly statement. If you’ve opted out of paper statements, keep an eye on email from the card issuer or alerts when you log in to your account online. No, you can’t refuse an increase in your APR. But since non-penalty rate increases apply only to future transactions, you can simply stop using the card and pay off your current balance at the old rate. As long as you don’t make any new purchases, you will avoid paying the new, higher rate. If your credit card company imposes a penalty rate increase because you have not made a payment in 60 days, the new rate does apply to your current balance plus any new charges. The card issuer must reduce the rate if you make all your payments on time for the next six consecutive months after the higher rate is imposed. You can only be charged an over-limit fee if you have given your card issuer permission to allow you to make transactions that exceed your credit limit and to charge a fee when you do. If you have not given permission, transactions that exceed your limit are likely to be declined at the point of sale. If they are allowed to go through, you can’t be charged a fee. If you’ve opted in to allow over-limit fees, you can only be charged one fee per billing cycle. An over-limit fee cannot be more than the amount by which you exceeded your credit limit or $25, whichever is less. For example, if you exceeded your limit by $10, the over-limit fee can only be $10. If you exceeded your limit by $100, the over-limit fee can only be $25. I found a mistake on my credit card statement. What should I do? If you find a transaction on your bill that is the wrong amount, for something you didn’t accept or for an item or service that was damaged or not delivered, call your credit card company immediately to file a “dispute.” To retain your consumer rights, you must dispute the item within 60 days of the bill that first contained the error—a good reason to check your account statement or online transaction history regularly. The card issuer must acknowledge your complaint in writing within 30 days unless the problem has been resolved in your favor. Your dispute must be resolved within the shorter of two billing cycles or 90 days. During the investigation period, you have the right to withhold payment on the disputed amount. However, you still have to pay the undisputed portion of the bill, plus any finance charges and fees, by the due date. 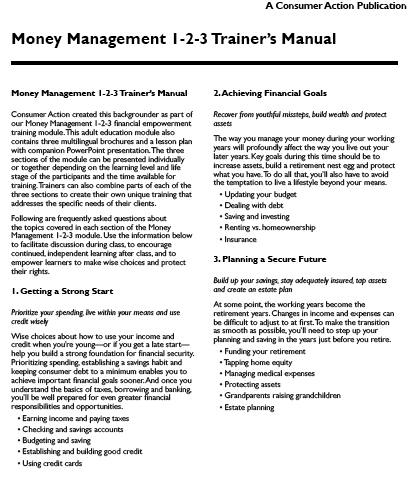 Following are frequently asked questions about the topics covered in Part 2 of the Money Management 1-2-3 module. How often should I update my budget? There is no set schedule for updating your budget, but it should at least be any time there is a significant change in your income, expenses or goals. If you use budgeting software or online worksheets (see the Budgeting and Saving section in Part 1), making adjustments is quick and easy. What are financial goals, and how do I set them? Financial goals are personal benchmarks that you set for yourself throughout life. They often fall into short-term, medium-term and long-term categories. Short-term goals are ones you would like to achieve in a year or less, such as purchasing a computer or paying off your credit card. Medium-term goals typically have a target of two to five years—for example, paying off a car loan or saving up to buy a good used car. Long-term goals take more time to reach—it might take five years or more to be in the position to buy a home, and much longer to save enough for a secure retirement or your child’s college education. Create your own goals worksheet or use this one from the National Endowment for Financial Education. Should I consolidate my various debts? It’s possible that consolidating your debts could result in a single more manageable payment. But beware of the expenses of consolidating—some loans carry fees and possibly an interest rate that is higher than what is currently being charged on one or more of your debts. If you consolidate through a second mortgage or home equity line of credit, you could lose your home if you can’t keep up with the payments. Consumer credit counseling agencies offer a form of consolidation—a debt management plan (DMP)—that could deliver benefits without putting your home at risk. But a DMP is not right for everyone, and not all creditors accept the proposed new terms. Contact a non-profit consumer credit counseling service to learn more. I heard a radio ad for a company that promises to settle my high credit card debt for a fraction of what I owe? Is there any downside to this? Under for-profit debt settlement programs, the company negotiates with your creditors to allow you to pay off your debt for a lump sum that is less than the actual balance. To accumulate that lump sum, you typically are instructed to stop making payments on your debts and put that money into a savings account that the company administers. While you are withholding payments, however, your credit is damaged and interest and fees on the debt continue to accrue. You also might not be able to afford depositing money each month for the settlement. Even if you do, the creditor(s) might not accept a settlement and might choose to move forward with a lawsuit instead. Be aware, too, that depending on your finances, any debt that is forgiven (the difference between what you owe and what you settle for) could be considered taxable income and result in a tax bill. Companies offering debt settlement services by phone—whether they call you or you call them in response to an ad—are not allowed to charge upfront fees. Under the law, they can only collect a fee from you after they have renegotiated the debt. Rather than hiring a debt settlement company, try negotiating with your creditors directly, either for an affordable settlement or for reduced payments, interest rates and fees. Or contact a credit counselor for advice and possibly to enroll in a debt management plan. If these options don’t get you back on track, consider talking to a bankruptcy attorney to learn about that option. For general information, read Consumer Action’s publication Personal Bankruptcy: Your financial fresh start. A debt collector contacted me but I don’t believe I owe the debt? What should I do? There has been a rash of fake debt collector calls to consumers from callers who either inflate the debt balance, don’t have the right to collect on the debt or fabricate the debt entirely. To protect yourself and verify that the debt is legitimate, accurate and being collected legally, ask the caller for his/her name, company, street address and telephone number and request a written “validation notice.” Do not confirm or give the caller personal financial or other sensitive information. And don’t assume the collector is legitimate just because s/he has some of your personal information, either. Contact the original creditor to verify that the caller has the right to collect on the debt. Report the call to the FTC and your state attorney general’s office if you have determined it is a scam. Consumer Action’s publication When a collector calls: An insider’s guide to responding to debt collectors can help you determine whether a collection call or letter is legitimate and how to proceed. I am an active duty servicemember. Are there any laws that protect me from predatory lenders? If you’re an active duty member of the armed forces or are on active Guard or Reserve duty, the Military Lending Act (MLA) prohibits your being charged an interest rate higher than 36% MAPR on some types of consumer loans, like certain payday loans, auto title loans and tax refund anticipation loans. It also protects your spouse and certain dependents. (The Military Annual Percentage Rate (MAPR) is similar to the standard Annual Percentage Rate (APR), but it includes some other fees and charges, such as administrative and membership fees, credit insurance premiums, any service or credit renewal charges, the cost of credit-related products sold in connection with the loan, and any other fees that are known at the time the loan is made.) Starting on October 3, 2016, MLA guidelines will apply to almost any other type of loan or credit, except mortgages (including home equity lines of credit), secured auto loans and credit cards. MLA rules will apply to credit cards as of October 3, 2017. Learn more about the MLA in general and the changes in which products are covered. The Servicemembers Civil Relief Act (SCRA) allows servicemembers to have the interest rate on most preexisting loans or credit lines (mortgages, credit cards, car loans, some student loans, etc.) capped at 6% during active duty. The 6% cap applies only to debt incurred prior to military service. New debt incurred while on active duty will be assessed interest at the regular APR. In most cases, you must make a written request that includes a copy of your military orders and an explanation of how/why military service makes it difficult to make your payments. It also allows you to cancel auto and home leases under certain circumstances, and provides some other protections. Learn more about the SCRA. I’m interested in attending a job training program. How do I avoid getting too deep into student loan debt? The key to choosing a school that is a good value and avoiding unmanageable student loan debt is doing some research. In particular, check out the school’s track record of graduation rates, graduate employment rates and pay, school reputation in the industry you plan to work and cost. Many for-profit colleges and trade schools (also known as vocational or training schools) have come under increased scrutiny for misleading students about their job prospects after graduation. These schools have been accused of marketing false job placement rates, using misleading recruitment practices and providing fraudulent accreditation, all while charging students high-priced tuition and fees for degrees that prove worthless in the job market. The cost of such programs can be tens of thousands of dollars more than a similar program at a community college. In addition, credits from some of these programs are not transferrable to other schools. Before you make a decision on a vocational school, read Consumer Action’s Guide to Finding the Right Job Training School (will be published soon). I’m going to need a student loan to attend school. How do I choose one? It’s very important to avoid taking on unmanageable student loans. Shop around for schools and programs that offer good value for the tuition you pay. Read Consumer Action’s Guide to Finding the Right Job Training School (will be published soon) and the U.S. Department of Education’s College Scorecard for guidance. Before you take out a student loan, find out if you qualify for financial aid. The Free Application for Federal Student Aid (FAFSA) gives you access to the largest source of financial aid to pay for education. In addition, many states and colleges use your FAFSA data to determine your eligibility for state and school aid, and some private financial aid providers may use your FAFSA information to determine whether you qualify for their aid as well. Get more information about financial aid options at the U.S. Department of Education’s Federal Student Aid website. If you must take out a student loan, try to make it a federal student loan rather than a private one. Federal loans offer more flexible repayment plans and may offer better rates/terms as well. Learn more about the differences from the Consumer Financial Protection Bureau (CFPB) here and here. I am having trouble making my student loan payments—what should I do? If your loan is in default, you might be able to rehabilitate it, which requires you to make nine “reasonable and affordable” payments in a 10-month period. If you succeed, the lender would remove the default notation from your credit reports. Another option might be to consolidate your loans into one new loan that offers affordable payments. In this case, your credit reports would still reflect the default. Learn more in Should I Consolidate or Rehabilitate My Federal Student Loan? from the National Consumer Law Center. Learn more about your student loan repayment options at www.StudentLoans.gov, the Consumer Financial Protection Bureau and in Consumer Action’s Student Loan and Education Resource List. Private student loans offer fewer options for financially strapped borrowers. Learn more at www.StudentLoanBorrowerAssistance.org/repayment/private-loans/. I am an active duty servicemember with a couple of student loans I took out before entering the service. How can I have the interest rates on these reduced to 6% under the Servicemembers Civil Relief Act (SCRA)? As an active duty servicemember, you are eligible to have your interest rate reduced to 6% on both federal and private student loans. New rules announced in June 2014 make the interest rate reduction on federal student loans (not private student loans) under the SCRA automatic. However, it would be wise to confirm at the beginning of your service that the rate reduction has been applied. For private student loans, you must submit a written request along with a copy of your duty orders to each of your loan servicers to get the rate reduction. Requests may be submitted anytime during active duty and up to 180 days after completion, but submission at the start of your service is best to avoid the possibility of your creditor arguing that your finances must not have been negatively affected by active duty if you were able to make your loan payments at the regular interest rate consistently throughout your service. Learn more in the Consumer Financial Protection Bureau’s Tackling Student Loan Debt guide for servicemembers. If you believe your student loan account hasn’t been handled properly, you can submit a complaint about your loan servicer to the agency at www.ConsumerFinance.gov/complaint or 855-411-CFPB. I’m leaving the military and want to use my education benefits to pursue a job training course? Why should I avoid for-profit and career colleges? While there may be legitimate for-profit and career colleges, many employ deceptive marketing and high-pressure sales tactics to get students to enroll and take out expensive loans. Community colleges and public universities typically offer lower-cost, higher-quality, accredited degrees. And federal student loans (offered by the government) are better than private loans because they tend to charge lower, deferred interest, more flexible repayment options and even cancellation of the debt under certain circumstances. Visit the VA’s “School Decision Resources” page to find links to tools and information that will help you make smart education and student loan choices. If you must take out a loan, make it a federal student loan. Learn more about your education funding options at the Consumer Financial Protection Bureau’s (CFPB) “Paying for College” webpage. The U.S. Department of Education maintains a database of accredited postsecondary institutions and programs. U.S. News and World Report, one of the leading college and education program ranking sources, includes a section titled “Best Colleges for Veterans”. Don’t rely on a recruiter’s claims: Ask around about the reputation of the school or program you’re considering. Ask employers if a degree or certificate from that school or program would help you get hired. A public school or a job-training program offered by a government agency or non-profit might be a better bet. What is compound interest and why is it important to me? In a nutshell, compound interest means you earn interest on your interest. For example, say you invest $100 at 10% interest per year. You would earn $10 ($100 x 10%) in the first year. In the second year, you would earn $11 through compound interest because you would earn interest not only on your principal (the original $100), but also on the interest you previously accumulated ($10). The power of compound interest becomes far more dramatic as your money grows. Compound interest is always better than simple interest (where you earn interest only on your principal) when it comes to saving. See what a difference compound interest can make by using an online calculator such as the ones offered at Investor.gov and Bankrate.com. How can I maximize the interest I earn on CDs? Certificates of deposit (CDs), also called time deposit accounts, are a safe way to make your money grow, but they typically pay very low interest rates unless you commit to leave your money on deposit for a longer period. CD laddering entails splitting up your money among CDs of different maturities so that you can take advantage of higher interest rates while not tying up all your money for a long period. For example, if you had $20,000 to invest, you could divide it evenly among a six-month, one-year, 18-month and two-year CD. This means you’re never more than six months away from 25 percent of your money becoming available. And if interest rates rise, you’ll be able to reinvest at a higher rate sooner. If rates go down, you’ll still get higher rates on your longer-term CDs until they mature. Where can I learn more about retirement planning and tax-advantaged retirement accounts? How can I learn more about my employer’s retirement plan? For more information on understanding your retirement plan, visit the Department of Labor’s Employee Benefits Security Administration (EBSA) online. You can also ask your Human Resources (HR) department for assistance; the HR representative may refer you to the plan administrator. If you have an unanswered question or a complaint about your retirement plan, contact EBSA or 866-444-EBSA (3272). I’m in the military. Are there any retirement plans available to me? If you stay in the service for at least 20 years, you are eligible to receive a pension based on a percentage of your basic pay (the percentage increases with years of service). Learn more about the military retirement system. You can receive both Social Security benefits and military retirement. Generally, there is no reduction in either for receiving both. Your Social Security benefit will be based on your earnings throughout your working years. Visit www.SSA.gov/myaccount for more information. The government offers a Thrift Savings Plan (TSP), similar to the 401(k) plan offered by private companies, to federal employees and members of the uniformed services. Servicemembers can choose how much money to deduct from their pretax pay and decide where to invest the money among the options offered. You don’t pay taxes on your contributions or investment earnings until you withdraw the money in retirement. Learn more at TSP.gov and Military.com. Consider opening and contributing to a Roth IRA. Military members can even make Roth IRA contributions with non-taxable income (combat pay), making both their contributions and withdrawals tax-free. Learn more about Roth IRAs for servicemembers. If you are deciding between the Thrift Savings Plan and a Roth, the Thrift plan will most likely be the better option if you receive matching contributions from the government. If you don’t receive any matching contributions, then a Roth might be the better option. Speak to a financial adviser for guidance. What if I don’t have enough income to save for both retirement and my child’s college education? Most experts recommend saving for retirement rather than college if resources are very limited. That’s because there are other sources of money for college, including student loans, financial aid, scholarships and work-study programs. That’s not the case for retirement. There also are education-related tax breaks (the Hope credit and the lifetime learning credit, or a tuition and fees deduction, for example) for those who meet income guidelines. Learn more about education-related tax breaks in IRS Publication 970, Tax Benefits for Education, at the IRS website. For information about federal student aid, visit www.FederalStudentAid.ed.gov. Can I borrow from my 401(k) or similar retirement plan? You typically have five years to repay the loan. But if you leave your job—willingly or not—you will most likely be required to pay the outstanding balance within, typically, 60 days. If you can’t pay it back, it will be treated as a distribution and you will pay tax on it. If you’re under 59½ at the time the loan is due and you can’t repay it, it will be considered an early withdrawal, which means you’ll pay tax on the money as well as a 10 percent penalty. Though the interest you pay on the loan goes back into your account, the rate may be lower than what your money would have earned if it had stayed invested in the 401(k). The money you use to repay the loan is not pre-tax money, the way your 401(k) contributions were. So, for example, if your monthly payment is $250 and you’re in the 28 percent tax bracket, you’ll have to earn about $350 before taxes to make that payment. And then you’ll pay taxes on the money a second time when you withdraw it in retirement. If you use a debit card to access the loan funds, you will most likely pay fees to the card vendor. Your net worth is the total of your assets (money, property and possessions that you own) minus the total of your liabilities (money that you owe). Here is a simple example: John and Mary live in a house that is currently worth $200,000. They have a car with a current market value of $15,000, a savings account with $20,000 in it and retirement accounts worth $80,000. Added up, their assets are worth $315,000. They have a mortgage on their house of $100,000 and the balance on their car loan is $5,000, making their liabilities $105,000. If you subtract $105,000 (liabilities) from $315,000 (assets), you find that John and Mary’s net worth is $210,000. There are many free online net worth calculators—for example, these from CalcXML and CalculatorWeb. Be careful about where you get your investing education, since many sources of information can be biased by affiliations or advertising. A good place to start is the U.S. Securities and Exchange Commission (SEC). Choose from a long list of publications at the “Beginners’ Guide to Investing: Online Publications at the SEC” webpage. My employer-sponsored retirement plan is invested entirely, or mainly, in shares of the company’s stock. Is that safe? Anytime you put all your eggs in one basket—or all your money into one stock—you increase your risk of losing it. If that stock does poorly, so does your portfolio. And if the company goes under, you could lose both your job and your retirement money. Whenever possible, diversify (spread out) your investment money. Learn more about diversification on the SEC webpage “Beginners’ Guide to Asset Allocation, Diversification, and Rebalancing”. And check out the “Research Your Company’s Stock” section of the SEC’s “Beginners’ Guide to Investing” page. How do I find a reputable financial planner or tax adviser? It’s your money at stake, so it’s very important to choose a financial planner, stockbroker, accountant or other financial professional carefully. You can find a fee-only financial planner (one that does not earn commissions on investments and financial products you purchase) through the Garrett Planning Network or the National Association of Personal Financial Advisors. If you are unhappy with your adviser’s conduct, the SEC handles complaints. View instructions online. Where can I learn about my rights as a renter? You can learn about federal laws such as the Fair Housing Act at the U.S. Department of Housing and Urban Development’s (HUD) website. State and local governments also have their own laws that govern the landlord-tenant relationship. Find your state or county’s landlord-tenant handbook at your public library or by doing an online search for keywords “landlord tenant handbook” plus the name of your state or county. Or access a state-by-state listing of tenant laws, rights and responsibilities on HUD’s website. Learn how to recognize housing discrimination by reading Consumer Action’s Know the Signs of Housing Discrimination. If you think you may be a victim of discrimination, follow the instructions in the companion Filing a Housing Discrimination Complaint. A tenant history report is a specialty consumer report that compiles rental-related information on individuals and sells it to landlords. It may be a good idea to check your report for any errors before you submit a rental application. I have low income. Is there housing assistance available? Local public housing agencies can help you determine if you are eligible for subsidized housing. To find your local housing agency, look under Housing in the government pages of your local telephone directory, or visit HUD online for a state-by-state listing. Should I definitely buy a home rather than rent one? Personal finance columnist Michelle Singletary covered this topic in one of her columns. The answer, in a nutshell, is not necessarily. There are many factors to consider, including what the real estate market in your area is doing, how long you plan to stay in one place, and what your financial and employment outlook is. While there may be a financial argument against buying in some cases, there are other things to consider. Owning your own home means that you have far more control of your physical living space. More important, it means that you can’t be evicted. There are many elderly renters who find that they suddenly need to find a new home because their landlord wants to sell or move a family member into the rental. Stability, security and personal control often are worth far more than money. It’s a good idea to use a HUD-certified housing counseling agency for guidance in buying your first home. In addition to the HUD online directory of housing counselors, first-time homebuyers with low income can get assistance through NeighborWorks America (800-438-5547). Local affiliates may offer free or low-cost home buying classes and downpayment assistance. What cost information should I receive from my mortgage lender? As of August 1, 2015, the home purchase and mortgage documents and disclosures you receive have changed to improve clarity, make it easier to comparison shop and prevent surprises at closing. The new Loan Estimate document replaces the previously used Good Faith Estimate (GFE) and the initial Truth-in-Lending (initial TIL) disclosure. This document, which discloses the terms of the loan and provides estimates of the loan and closing costs, must be given to you within three business days after you submit your loan application. This is a good tool for comparing loan options because it shows all the fees you would be charged for taking out the loan. The estimate is not a guarantee, however—some numbers, such as your interest rate and points, can change until you “lock” (make a commitment). The new Closing Disclosure document combines and replaces the HUD-1 settlement and final Truth-in-Lending (final TIL) disclosures. This document, which provides details about loan costs and features, must be given to you three business days before the loan is finalized. A point is one percent of the loan amount. Lenders typically offer interest rate/point combinations where the more points you pay upfront, the lower your interest rate for the life of the loan. You have to do some number-crunching to find the “sweet spot.” Generally speaking, the longer you plan to have the loan (stay in the home and not refinance), the more sense it makes to pay points. The Mortgage Professor offers some insight into how the point system works and when—if ever—it makes sense to pay them. Also known as an impound account, an escrow account holds extra funds you pay to the lender each month (above your mortgage payment) to cover your annual insurance premium and property taxes. An escrow account is mandatory in many cases, but buyers who put at least 20 percent down to purchase the property often have the option to forego an escrow account and pay their insurance and taxes on their own. To tap equity in the home. Consider the costs and potential risks of refinancing (reducing your equity, accumulating debt, staying in debt longer, etc.) before you sign the loan documents. The general guideline when refinancing for a lower interest rate is that if the cost of refinancing can be recouped in two years or less through the monthly mortgage payment savings, then it pays to do it. Of course, each situation must be considered individually. What does it mean to be “underwater” or “upside down”? It means you owe more on your mortgage(s) than the property is worth. What is a “short sale” and a “deed in lieu of foreclosure”? A short sale means you sell the home for less than you owe the bank. The bank must consent to a short sale, since it is being “shorted” part of the money you owe. The benefit of a short sale is that the bank suffers a smaller financial loss than a foreclosure would cause, and the borrower avoids the more serious damage that a foreclosure would do to his/her credit report. In some states, such as California, a short sale satisfies the debt. In other words, the deficiency (the difference between the sale price and the loan amount) cannot be collected. In other states, the seller is still liable for the shortfall. A “deed in lieu of foreclosure” is similar in that the borrower voluntarily relinquishes the property to the lender. In this case, however, the lender is then responsible for selling the property itself. Who can I call if I am in jeopardy of foreclosure? Someone contacted me after I missed a few mortgage payments and said s/he could help me avoid foreclosure. Is this legitimate? If you are delinquent on your mortgage, at a certain point (the number of days varies from state to state) your lender will file a “notice of default,” or NOD. This is the first step in the foreclosure process, and the filing is of public record. Some questionable lenders and scam artists target homeowners who have had an NOD filed because they know they are probably desperate and are more likely to respond to any offer of help. If anyone contacts you about foreclosure prevention, ask for the person’s name, the name of the company and the call-back number. Then call your lender at the number on your mortgage statement and ask for assistance. You can also do an online search for the name of the company, and check complaint history with the Better Business Bureau. Do not pay a fee for foreclosure prevention services—help is available at no charge! How do I find a lawyer to help me deal with my predatory mortgage loan? You can search for a lawyer through the National Association of Consumer Advocates. The Legal Services Corporation allows you to search for local Legal Aid offices serving low-income individuals. How do I know if homeownership is right for me? Despite being called “the American dream,” homeownership is not right for everyone. If, for example, you prefer the freedom of renting, or if your job or career requires you to relocate frequently, buying a home might not be wise. Learn more about the responsibilities of homeownership and whether it would be right for you from Freddie Mac, the Federal Home Loan Mortgage Corporation, and Consumer Action. How can I stay on top of the financial responsibilities of homeownership? The best way to stay on top of homeownership costs is to follow a budget that accounts for these costs and to maintain an adequate emergency fund. Learn more about managing the costs of homeownership in Consumer Action’s publication Keeping Your Home: Protect your investment. What if I can’t afford my homeowners insurance premium this year? If you have a mortgage, the lender requires homeowners insurance. Even if your home is paid off, it is very dangerous to let your insurance lapse. If there were a fire or other major loss, you would lose the entire value of your home. And, if you didn’t have the money to rebuild, you would need to find another place to live. If you do not pay your annual insurance premium through an escrow account with the lender, you must pay it directly yourself. If money is temporarily tight, consider paying for your insurance monthly or quarterly for the time being instead of paying the full annual premium, if your insurer offers that option; shop around for better rates—you could save hundreds of dollars per year; and/or increase your deductible (a risk if you don’t have that money set aside, but better than going uninsured). If you let your policy lapse (get cancelled for nonpayment), in addition to risking your property or the costs of a lawsuit filed by someone who gets hurt on your property, your lender, when notified that your policy has lapsed, will purchase insurance on your behalf. “Force-placed” insurance is expensive and may not provide the best levels of coverage for you. If you try to purchase a new policy on your own, you may have difficulty because of the lapse, and your original insurer may not be willing to reinstate your policy. What if I can’t afford my property taxes this year? If you do not pay your property taxes through an escrow account with the lender, you must pay them directly yourself. If you pay your property taxes late, you will be charged a late fee. If you don’t pay your property taxes at all, the delinquent taxes become a lien on the home. The taxing authority could eventually take title to the home and sell the property to recoup the taxes owed, or sell the lien to someone who could then collect on the debt or foreclose on the property. In many cases, however, the lender will advance the money to pay the delinquent property taxes in order to protect its ownership in the property and then demand the money from you. If you don’t pay, the lender can foreclose on the property. Some counties offer programs that allow qualified homeowners to reduce their tax bill, defer payment or arrange a repayment plan. Contact your taxing authority (the agency that issues your property tax bill) to find out what your options are. Can I set up an escrow account after closing? What if I can’t afford auto insurance? If you live in California, you may be eligible for the California Low Cost Automobile Insurance Program, which offers low-income good drivers affordable coverage that meets the state’s financial responsibility laws. Learn more on the Consumer Action website. Residents of other states should contact their state insurance commissioner’s office to find out if assistance is available. Get contact information on the National Association of Insurance Commissioners website. One option might be to choose a high-deductible health plan (HDHP). If you purchase your health insurance through HealthCare.gov or your state’s insurance exchange, some “Silver” plans fit the criteria of an HDHP. Generally speaking, a higher deductible results in a lower monthly premium and qualifies you to fund a Health Savings Account (HSA). An HSA is a tax-exempt medical savings account you can contribute pre-tax dollars to and draw money from tax-free to pay for out-of-pocket health care costs. Unlike a Flexible Spending Account (FSA), funds roll over year to year if you don’t spend them. Only consumers with an HDHP can use an HSA. Specifically, your plan should state that it is a High Deductible Health Plan and is HSA-eligible. Learn more about HSAs and high-deductible health plans at ObamaCareFacts.com. AARP offers an online HSA calculator that helps you determine the potential savings of an HDHP with an HSA compared to a traditional health plan. If you leave your HDHP while you have a balance in your HSA, you can still spend the funds on qualified medical expenses until you’ve emptied the account. You just aren’t allowed to make any new contributions to the HSA while you’re not enrolled in an HDHP. You are many times more likely to become temporarily disabled in your lifetime then you are to die prematurely, yet many workers purchase life insurance but don’t insure their greatest asset—the ability to earn a living. Social Security provides disability benefits for workers and their families, but it is difficult to qualify for and benefits are very limited. And if you get sick or injured anyplace other than on the job, you won’t qualify for workers’ compensation. If your income is crucial to you and/or your family’s survival, make sure you are covered. First, find out what disability insurance coverage you have through work (short-term, long-term, both or none). Determine if what you have is adequate by using an online calculator such as the ones at LifeHappens.org and MetLifeIsEasier.com. If the coverage you currently have is inadequate, find out if your employer offers the option of purchasing additional insurance through work (the much cheaper option), or shop around for an individual disability insurance policy to fill in the gap. The Motley Fool offers some tips for purchasing coverage. Which is better, whole life or term life insurance? Whole, or permanent, life insurance combines a life insurance policy with an investment component. Term, or temporary, life insurance is purely insurance (there is no investment component). There are proponents of whole life, but many unbiased financial educators (i.e., they don’t earn money from consumers’ insurance purchases) argue that because you can get a higher amount of coverage for lower premiums with term insurance, most consumers are better off purchasing only what they need and investing the premium savings on their own, with the potential for higher investment returns. Learn more in this article from U.S. News & World Report. How do I find a good insurance agent or broker? The best place to start your search is with friends, family and other people you trust. Once you’ve narrowed down your list, contact at least three of the agents to discuss your needs. Compare the agents’ policy recommendations, price quotes and level of service. Go elsewhere if an agent seems to be pushing you to buy more coverage than you need. When comparing prices, make sure you’re comparing apples to apples. In other words, do all auto policies you’re comparing include rental car coverage and emergency roadside assistance? Do all the homeowners policies you’re comparing offer full replacement of the home, with building-code upgrades? You can check an insurance company or broker’s license status and their complaint record with your state insurance department. Find contact information for your state insurance commissioner’s office online. Check the financial stability and soundness of prospective insurers at ratings sites such as www.Moodys.com, www.AMBest.com and www.StandardAndPoors.com. J.D. Power and Associates publishes customer satisfaction rankings of insurance companies. Following are frequently asked questions about the topics covered in Part 3 of the Money Management 1-2-3 module. I feel like I’m lagging far behind my ex-husband in preparing for retirement. Are there any special resources for me? In addition to often earning lower wages compared to men, many women have the added challenge of having been out of the workforce for years to raise children. The Women’s Institute for a Secure Retirement helps women overcome unique retirement savings challenges. Is an annuity a good option for making my retirement money last for the rest of my life? Buying an annuity or taking the balance of your employer-sponsored retirement account as an annuity may be an option. An annuity guarantees you equal monthly payments that last your entire lifetime, whether that means three years or 30 years. It may also last for the lifetime of your spouse if he or she outlives you. With longer life expectancies, this could be a real benefit. But an annuity isn’t right for everyone—they can be expensive, for one thing—so do some research and consider consulting a tax adviser or other financial professional—someone who wouldn’t earn a commission from your decision to buy an annuity. Visit the SEC to learn more about annuities. Suze Orman is another popular source of information about annuities, as are the authors of Personal Finance for Seniors for Dummies. How do I decide when to begin taking Social Security payments? How much you receive from Social Security over a lifetime depends on your earnings during your working years, the date you start receiving benefits and how long you live. If you are healthy and your family has a history of living to old age, then you might collect more over your lifetime by starting payments only at normal retirement age or later since your checks would be larger than if you started early. If your health is poor, it might be wise to begin taking benefits as early as possible even though your checks will be smaller. Money Talks News offers “16 Ways to Get Bigger Checks from Social Security”, which addresses the issue of when to start receiving benefits (however, one strategy—”file and suspend”—has been eliminated since the article was published). Also, try out the online Social Security Retirement Estimator. It produces estimates that are based on your actual Social Security earnings record. If the decision still is not clear-cut, consider consulting an independent, fee-only financial planner before starting payments. You can find one through the Garrett Planning Network or the National Association of Personal Financial Advisors. What is the penalty for withdrawing from my retirement account(s) early? In general, if you withdraw money before age 59½, you will have to pay a 10 percent penalty. However, there are some exceptions to this rule. Learn more by consulting with a qualified financial professional, do an online search for “early retirement withdrawal” or a similar phrase, or check out the resources from Bankrate, FindLaw and Balance Financial Fitness Program. The best time to learn about how to tap your retirement funds to your best advantage is before you retire. Even if you don’t retire before 59½, there are tax advantages to tapping certain accounts before others. Learn more from the National Endowment for Financial Education and CNBC. Can I continue to work while I receive Social Security? If you apply for Social Security before your full retirement age, there are limits on how much you can earn without losing some or all of your retirement benefits. The limits change annually. Phasing into retirement by working at your current job part-time could have benefits, but it could also negatively impact your future Social Security and pension checks. Learn more at Bankrate.com. Once you reach your full retirement age, you can earn as much as you like and still get all of your Social Security benefits. Learn more in the Social Security Administration’s guide How Work Affects Your Benefits. Could I lose my defined-benefit pension? An employer has the option to voluntarily end its pension plan by switching to a 401(k) or other defined-contribution plan, but it still would be required to pay you all the benefits you’ve earned. A pension could also be terminated because it’s underfunded—in other words, it doesn’t have enough money to pay all the benefits it owes. In this case, if the Pension Benefit Guaranty Corporation (PBGC) insures the plan, you will most likely still receive all your vested benefits, though there are some limits. You will not receive health benefits under PBGC insurance even if continued medical coverage was part of your pension benefits. Most defined-benefit plans are insured by the PBGC, but some are not. To find out if your plan is covered, check your summary plan description, available from your plan administrator. Then visit the PBGC online to find current coverage limits. Technically, both these loans are home equity loans, or “second mortgages.” But a home equity line of credit (HELOC) is structured as a revolving line of credit rather than as a lump-sum loan. Like a credit card, a HELOC allows you to borrow money up to a predetermined limit. The amount of your available credit shrinks as you use it and grows again as you repay the borrowed money. And, like a credit card, you have the option to pay the entire outstanding balance when the bill is due, or pay just a part of the balance and carry over the remainder to the following month. You make payments only on the amount you have used and pay interest only on the outstanding balance. Home equity lines typically charge a variable, or adjustable, interest rate rather than a fixed rate. This is important to know because if interest rates rise, so will your payments. Make sure, before you borrow, that you would be able to afford the higher payments if rates were to rise. If you can’t, you could lose your home. Many HELOCs allow you to borrow money for a certain number of years, say 10 or 15. At the end of the “draw period,” you may be allowed to renew the credit line, or you might be required to pay the entire outstanding balance immediately (a balloon payment) or over a fixed period (10 years, for example). It’s very important that you understand the terms of your loan. If you are not prepared to pay off the loan according to the terms you agreed to, you will put your home in jeopardy. A home equity loan, often referred to as a second mortgage, provides a lump sum of money on which you typically make fixed monthly payments over a predetermined period. At the end of the period, you will have repaid the loan in full. One advantage of a traditional second mortgage is that these loans typically don’t have fluctuating payments. A drawback of the loan is that you will pay interest on the full amount of the loan from the day you take it out, even if you don’t need all the money at once or you have repaid part of it. Learn more about home equity loans and credit lines from the Federal Trade Commission, and about home equity lines of credit from the Federal Reserve Board. How can I spot a home equity scam? Home equity scammers and predatory lenders make money by luring you into loans that are not in your best interest. Don’t apply for a loan based on a phone call, social media ad, etc. If you need a loan, contact financial institutions you know and trust, or seek out reputable lenders by getting recommendations from friends, family and coworkers. Do an online search for the lender’s name. You might find out quickly that the lender is shady based on multiple complaints and negative reviews. Check the company with the Better Business Bureau, the Consumer Financial Protection Bureau complaint database and your state’s attorney general. Don’t inflate your income, even if you are encouraged to do so by the lender. Some dishonest lenders pressure you to do this so that you qualify for a larger loan than you can afford. When you can’t keep up with the payments, the lender forecloses on your home. Don’t refinance repeatedly. This is expensive even with legitimate lenders, but some bad lenders pad each loan with high fees—sometimes for unnecessary items. Don’t be pressured to sign the loan documents if there are added fees, the interest rate is higher than was quoted to you or other costs and terms are different. Some lenders make changes at the last minute in the hopes that you won’t notice. If you object, they threaten to delay or cancel the loan. Don’t sign or initial any loan documents with blank spaces where the lender could later fill in rates, fees or other terms and information that could harm you. Don’t agree to make major repairs to your home (such as a new roof) through a home equity loan that a contractor arranges. The contractor probably gets a kickback, and the terms are probably not the best you could find. Learn more about recognizing and reporting predatory lenders and mortgage fraud at StopFraud.gov. I changed my mind—can I cancel my home equity loan contract? In many cases, you have the right to cancel a home equity loan (lump sum or line of credit) without penalty within three business days of signing the loan documents on your principal residence. You must cancel in writing. Learn more in “The Three-Day Cancellation Rule” section of the FTC’s “Home Equity Loans and Credit Lines” webpage. I need some money to replace my roof. Is a reverse mortgage my best option? Where can I learn more about reverse mortgages? Is there anyplace I can go for outpatient services if I don’t have health insurance? Find a nearby health center online. Where can I learn what Medicare covers and what it doesn’t? You can find all the information you need—from your coverage choices to enrollment instructions—at the Medicare website. AARP is another source for A-to-Z Medicare information. Should I put large medical expenses on a credit card? If your medical expenses are so high that you wouldn’t be able to pay the credit card bill off within a few months, consider other options. For example, it might be better to set up a manageable payment plan with the medical provider. Any finance charges or fees are likely to be much lower than you would pay on a credit card. (Beware of medical credit cards offered in doctors’ offices. These purpose-specific credit products lure with the promise of “no interest,” but if you don’t pay the balance off within the deferred-interest period, you get hit with retroactive interest at higher rates than you might have gotten elsewhere. Learn more in the medical credit card survey issue of Consumer Action News. Do not charge your medical bills on your home equity line of credit or take out a new home equity loan to pay them off. If you can’t make the payments, you could lose your home in foreclosure. Ask the hospital financial counselor or patient advocate (ombudsman) for advice, including whether or not there are any charitable programs you might qualify for—many hospitals have them. The federal Emergency Medical Treatment & Labor Act (EMTALA) requires a hospital to treat you for a medical emergency regardless of your ability to pay. Will medical debt haunt me by way of a lower credit score? As of mid-2015, the three major credit bureaus had decided to remove previously reported medical collections that have been paid off by an insurance company, so these would no longer affect your credit score. Will bankruptcy wipe out my medical debt? Generally speaking, filing a Chapter 7 bankruptcy—one where unsecured personal debts are discharged (wiped out)—would eliminate your medical debts. Once you receive a discharge under a Chapter 7 bankruptcy, you cannot receive another discharge in a Chapter 7 case within eight years, so if you again accrue unmanageable medical bills in that period, this option wouldn’t be available to you. You could possibly file again under Chapter 13 much sooner than that, but this type of bankruptcy requires you to repay a portion of your debt. Learn more about bankruptcy types and waiting periods at Nolo.com and in Consumer Action’s Personal Bankruptcy: Your financial fresh start. Bankruptcy can be a good choice under certain circumstances, but it’s not necessarily the best option in every situation. Learn more about your options for dealing with medical debt at www.Nolo.com. Also, consider contacting an accredited non-profit credit counseling agency, where a credit counselor can help identify your options and explain the pros and cons of each. Will an umbrella policy replace my house if it burns down or my car if it is totaled? No. Those types of losses are covered by your homeowners and auto insurance policies. Umbrella insurance supplements your homeowners and auto liability coverage—in other words, it only pays out to third parties for damage or injury that you cause to them. Considering how much a lawsuit can cost, umbrella coverage is very valuable protection for a relatively small amount of money (starting in the range of $150-$200 per year for a $1 million policy). Umbrella insurance typically also covers you for some things not included in a standard auto, homeowners or renters policy, such as false arrest, libel and slander. You typically purchase umbrella insurance from the insurer that covers your home and/or car(s). How do I decide whether or not to buy long-term care insurance? There is no way to know if you will ever need long-term care insurance. According to some experts, the coverage is not needed if you have very few assets or very great assets. This is because, on the one hand, you would most likely qualify for Medicaid, a government program that pays for medical services for low-income individuals. And on the other hand, you presumably could pay for custodial care out of pocket and not outlive your wealth. According to an article published by legal information company Nolo, it is consumers who have assets worth $300,000 to $500,000 above and beyond the value of their homes who may benefit most from long-term care insurance: They have too much to qualify for government aid, but perhaps not enough to cover their custodial care bills for as long as necessary. As part of your research and decision-making process, gather information from many sources. In addition to Nolo.com, you can find long-term care insurance information at www.AARP.org (enter “long term care insurance” in the site’s search bar). The Federal Citizen Information Center offers a Guide to Long-Term Care Insurance for free download. This article from an elder law attorney explores how likely you are to need long-term care insurance; it might help you in your decision-making process. Where can I purchase long-term care insurance? Some employers offer this coverage as an option for their employees. Group insurance, in general, is less expensive and easier to qualify for than individual insurance. If your employer doesn’t offer this option (or if you’re unemployed or self-employed, or you don’t like your employer’s offering), you would have to shop around for an individual policy. The Federal Long Term Care Insurance Program is available to Federal and U.S. Postal Service employees and annuitants, active and retired members of the uniformed services, and their qualified relatives. Where can I find information about managing the non-financial challenges of raising my grandchildren? HelpGuide.org offers a very detailed webpage dedicated to providing advice and tips for dealing with the emotional and relationship challenges that can come with raising a second family. AARP provides a Grandfamilies Guide, including a “Raising Grandchildren: Support” page. Check out the American Grandparents Association website for information about getting the personal, financial and legal support you need. Do an online search for “grandparents raising grandchildren support group” to find support forums such as the one that is active on the Daily Strength website. The American Association for Marriage and Family Therapy has a webpage devoted to identifying the challenges of grandfamilies, how to recognize when someone needs help, the types of help available and how to find a therapist. What are the essential components of an estate plan? Many people will also want a trust, which helps shield the estate from taxes and probate. Learn about estate planning at the Wills, Trusts & Estate Planning section of Nolo.com. Money Talks News also provides a good overview of the key pieces of an estate plan. Where can I get living will and health care power-of-attorney forms? All or most hospitals provide these documents upon request. You can also get them from attorneys. The American Bar Association’s (ABA) Commission on Law and Aging provides online tools for health care advance planning, including state-specific forms. Advisers encourage everyone age 18 and older to prepare these documents. I’ve been living with my partner for 20 years. Do I need a will? Estate planning in general, and a will in particular, may be even more crucial for unmarried couples. That’s because inheritance laws that protect married couples do not apply to unmarried partners, regardless of how long you have been together. But if you want your non-beneficiary assets to go to your partner when you die rather than to your next of kin, you will need a will, and perhaps guidance in other areas to ensure your property passes in the most tax-efficient way. How can I make sure my “digital assets” are handled the way I want after I die? Your digital assets include things like your online accounts (including social media and email); photo, music and video collections; your computer’s hard drive; and data stored on another server (or in the cloud). If you want anyone to be able to access them after your death, you should write a letter, to be included with your will or provided to your executor, stating who should have access to each account and what you want them to do with it. Make the login information (username, password and answers to security questions) for each account or device accessible to the person who will be managing or closing the account. Services that can help you plan and prepare for the management of this part of your estate include LastPass, Sticky Password and SecureSafe. You don’t need to use a service, but if you do, shop around and compare features and fees. Learn about many such services in the digital estate planning issue of Consumer Action’s quarterly consumer newsletter. Someone contacted me regarding setting up a trust. Is this legitimate? If you are contacted by someone you don’t already have a working relationship with, it could be a scam. That could also be the case if you respond to an advertisement for living trusts. In either case, keep your guard up. Some of these businesses are known as “living trust mills” because they aggressively sell trusts and investment products, typically to seniors, with little regard for their best interests. The salespeople typically are not attorneys, so any legal advice you get from them may not be accurate. Regardless of what state you live in, you can learn more about trust mills at the website of California’s attorney general. How can I find an estate planning attorney? Asking a trusted CPA, investment adviser, stock broker or other financial professional who they use themselves. Visiting the American College of Trust and Estate Counsel (ACTEC) online to get a list of attorneys in your area. To participate in ACTEC, an attorney must have at least 10 years’ experience, must focus his or her practice on estate planning and probate, and must be recommended by his or her peers. Has malpractice or liability insurance, in case s/he makes a mistake. How long have you practiced in the estate planning field? How would you rate your level of experience and qualifications in estate planning law? Are you a member of any bar associations or estate planning organizations? Are you current with the bar’s continuing education requirements? Does your firm back you up with liability or malpractice insurance? How do you deal with complicated family conflicts? Can you give me an example of a very simple case you’ve had versus a very complicated one? Ask for and check client references. Do not make price your number one criteria.